When LovelyWife came home from work yesterday, she had bought eggs. She put them in the fridge. Click to embiggify… If you can’t see the eggs. I’m telling you it’s a disease. Look at those eggs RIGHT ON THE EDGE of the shelf. You know how it starts with “There’s a lot of crumbs in this toaster” and ends with taking the whole kitchen back to studs? Yeah, that. I’m the Original Canadian Gangster with Obsessive Compulsive Disorder. 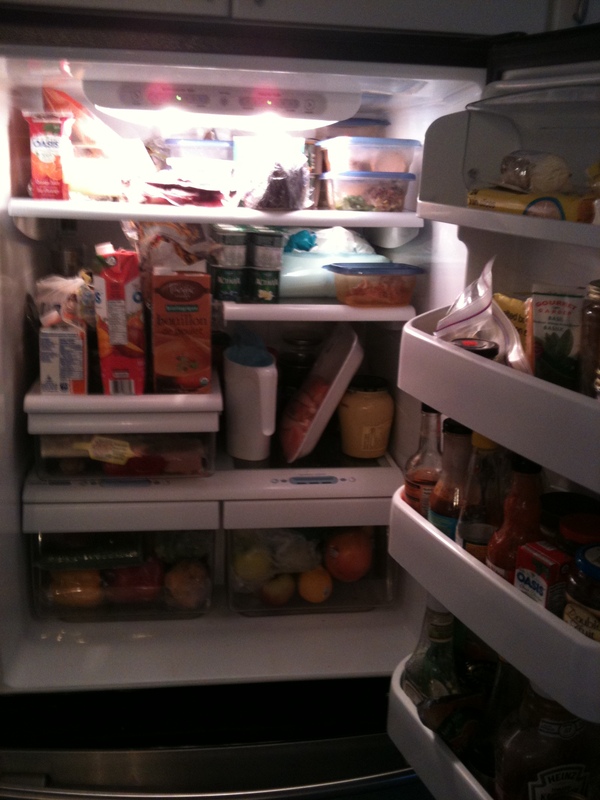 Today I cleaned the fridge. 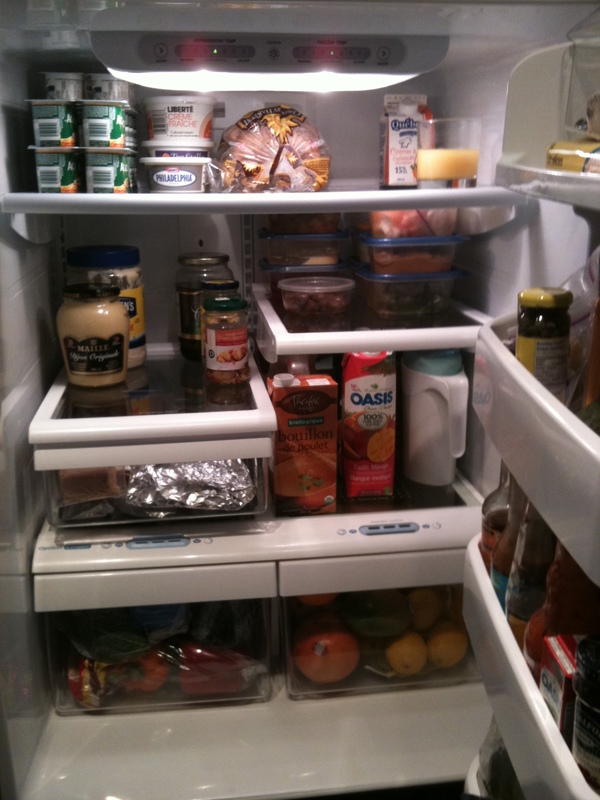 Now before I show you the after shot, let’s talk about the before state of my fridge a little. If you look closely, you can see a Styrofoam container with chicken breasts leaning against a Dijon mustard container. You can see mangoes in the vegetables drawer. You can see an eggplant right on the edge of the fist shelf, a ziploc container on the edge of the second shelf. Short containers in tall spaces, tall things in short spaces. Yogurts on two different shelves. Now here’s what I did without throwing anything away. In fact, I even added a juice container. Of course I started by cleaning the inside of the fridge and all the shelves themselves. I swear I’m the only guy in the world who knows that those glass inserts actually come out of the plastic frame if you pry hard enough. Notice how all the yogurt is huddled together. Notice how tall items are on a tall shelf, and short items are on a short shelf. when they share a shelf, taller items go in the back, and shorter items go in front so we can read the labels – which are all facing forward in case you didn’t notice. Fruits are in the fruits drawer, vegetables in the vegetables drawer and meat is in… The meat drawer. Notice how nothing is precariously perched at the edge of a shelf, and how nothing touches the inside surface of the fridge to facilitate better airflow? Now if you’ll excuse me, I just realized I didn’t clean the items in the door.